Last year, the Trump administration withdrew from the Trans-Pacific Partnership (TPP), but is now signaling officials to explore rejoining if only a “substantially better” deal is negotiated. “Would only join TPP if the deal were substantially better than the deal offered to Pres. Obama. We already have BILATERAL deals with six of the eleven nations in TPP, and are working to make a deal with the biggest of those nations, Japan, who has hit us hard on trade for years!” tweeted President Donald Trump on Thursday. American farmers, in particular, have voiced concerns regarding the recent tariff feud with China. Trump has threatened to imposed tariffs on about $100 billion in Chinese products, but the president is optimistic about the recent negotiations. “He’s going to get rid of a lot of taxes and tariffs,” said Trump about Chinese President Xi Jinping. This week, Trump directed both Larry Kudlow, White House Economic adviser and Robert E. Lighthizer, the U.S. Trade Representative to look into rejoining the Asia-Pacific trade pact. Several lawmakers in farm states in support of the U.S. rejoining the TPP because it would open up more markets to U.S. farming industry. “That certainly be good news all throughout farm country,” said Sen. Pat Roberts, Kansas Republican and chairman of the Senate Agriculture Committee. After the U.S. dropped out of the TPP last year, 11 nations, including Canada, Japan, Mexico, Australia, and others, signed their own deal. Some countries don’t seem open to changing the terms. Japan’s Toshimitsu Motegi, who is also the minister in charge of TPP, expressed similar sentiments. “The U.S. had agreed with TPP-12 and then left, and says it wants more on its return. That is not acceptable—it is against negotiation rules,” said Yorizumi Watanabe, a former Japanese trade negotiator to the Wall Street Journal. However, other nations like Vietnam seem more open to having the U.S. rejoin. According to Sasse, Trump believes that the “TPP might be easier to join now” since the other countries have agreed on their terms. Not to mention, it would involve less negotiating in the future. “One of the White House officials said that while the president prefers negotiating bilateral trade deals, a multilateral deal with the TPP countries would counter Chinese competition and would be faster than negotiating one-on-one with each of the 11 other nations,” writes Newsmax. Author’s note: This all appears to be part of Trump’s negotiating tactic. China doesn’t want the U.S. to be part of the TPP. 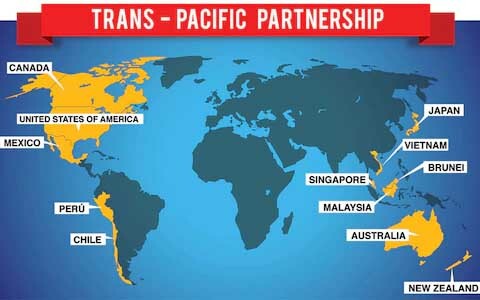 We will see if the TPP nations are really set on the current agreement or they are just taking a hard stance.